We can install Office 2010 for free to trial using in some days, After the free period passed, how are you going to do? 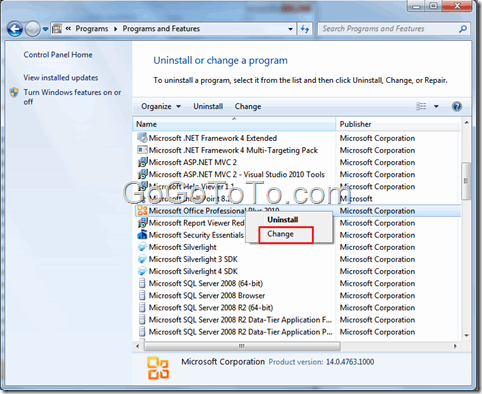 If we buy product key, how can we apply the product key without re-install Office 2010 ? Office 2010 does not provide a direct user interface to let user input product key. They just provides a activate UI such as phone call service in Word 2010 Help menu. We should go to Control panel to find the solution. Then you can see the following window, there is an option: Enter a Product Key. 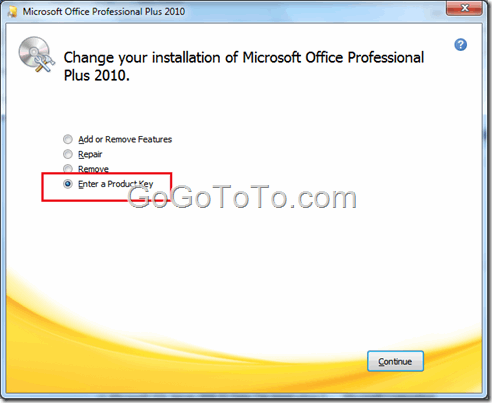 Now input your Office 2010 product key, if your product key is valid, System will continue to install something which is like the following screen. After installation finished, your product key updated done also. 2 years ago. I have implemented a small tool which it can generate MS word document with dynamically data from SQL server database to replace some wordings from original MS word document. This tool was for an existed ASP.NET web application. The user had to output lots of MS world document or PDF document everyday, but most of document have the same template, the user need to change some data fields due to the template document and output real MS word document due to real data from database. The most best solution is using MS word 2003’s XML feature. Using word XML feature, we can convert the word file to several format file such as .doc, .xml, .pdf.. I learnt something from an article which posted on Microsoft website, Please read here for detail.